When it comes to studying construction trades, international students have a number of options. Learn what type of construction trade you might be interested in. Construction is a large field that encompasses a wide range of different jobs. When studying construction, you can earn a certificate, associate’s degree, bachelor’s degree and even a master’s degree. Construction trades include anything from plumbing to construction site manager. With a degree in construction trade, you can either go into business for yourself, such as starting a small plumbing company, or choose to work for a large company, such as working on a roofing crew. The classes you take in college will depend on the type of construction you intend to pursue. It is recommended that you take some business courses as well as the required course load for whichever program you select. Taking business courses during your study will help prepare you for owning your own business, teaching you important skills such as marketing. The business courses to consider taking are marketing, economics, finance, strategy, business law and professional ethics. As a construction trades student, the general courses you will most likely take are math, safety procedures, mechanical drawing and woodworking. All construction trades deal with math in one way or another. If you are planning on pursuing a degree in construction trade, you will need to be proficient in arithmetic. When choosing a college, it is important to ensure that all of these courses are offered. An example of one such school is Mississippi State University	. Mississippi State offers a four-year Bachelor of Science degree in construction management. The curriculum is built upon a knowledge base in business, engineering, and construction sciences. Construction management students take general education courses in math, science, and business, as well as construction-specific courses such as construction systems, building technology, structures, materials and methods of constructing, estimating, scheduling, safety, project management, and construction law. Wherever you choose to study, make sure the institution incorporates apprenticeships in the program. The best way to learn construction trades is to have practical practice. An apprenticeship is the best way to receive hands-on technical training. 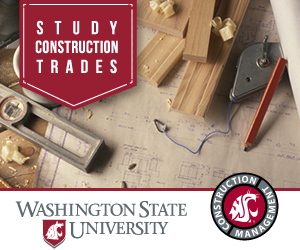 When studying construction, you can earn a certificate all the way up to a master’s degree. While many jobs in the construction trades are available to high school graduates, training is required for the specific skills each construction job calls for. Some of the jobs you might consider include carpentry, plumbing, painting, roofing, brick mason, drywall installation, finishers, electricians, etc. If you are interested in a job as a safety manager or site manager, then a higher degree is required, such as a Masters in Construction Management, which can be obtained through Arizona State University. Arizona State offers a BS, an MS, and a Ph.D. in construction management. The MS degree is even available as an online study. Students studying construction management at Arizona State University can choose between a focus on general building construction, heavy construction, specialty construction, and residential construction. Graduates with a degree in construction trades have a wide variety of career options to choose from. Students who are interested in management might pursue careers as a construction manager, construction and building inspector, property manager, or first-line supervisors of installers. All of these jobs involve managing and overseeing construction sites, and are generally in high demand. If you’re not interested in management you might work as a drafter, electrical power-line installer, construction and building inspector, or insulator. While management positions oversee an entire site, these professionals work on one aspect of the construction. Construction Trades are a wide field. There are many different trades from which to pick. When studying the construction trades, you will need to first select what type of trade you might be interested in. This could be roofing, dry walling, electrical work, brick mason, etc. Once you have figured out when type of trade you would be interested in, then you need to look into what type of degree that job requires. Visit the Study in the USA School search to find schools that offer programs of study in Construction Trades. Is a Degree in Construction Trade Right For You? Over time we will be updating this section and including more information for those who want to study construction trades in the USA and for other countries, but please feel free to post your thoughts and comments on our Facebook fan page, and also follow us and post questions through Twitter.